Even if some companies aim to be the “Email Killer”, e-mail is the most used form of communication between colleagues, as well as clients and external companies. Email has come a long way since its original use as a method for quickly exchanging messages. Today, business emails are documents in every respect. 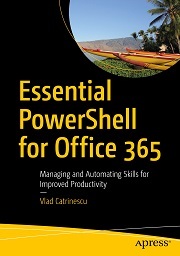 Yet emails are still relegated to silos like Microsoft Exchange, while other documents such as proposals, contracts and product specifications are handled by traditional document management systems such as SharePoint. And with the dozens of emails you get daily, it’s easy to lose an important email that contains requirements, statements of work or that important detail about your client that your team should know about. Store emails messages from Outlook directly on SharePoint using the harmon.ie sidebar. By staying within the Outlook window, you remain in focus while helping to organize emails and documents. 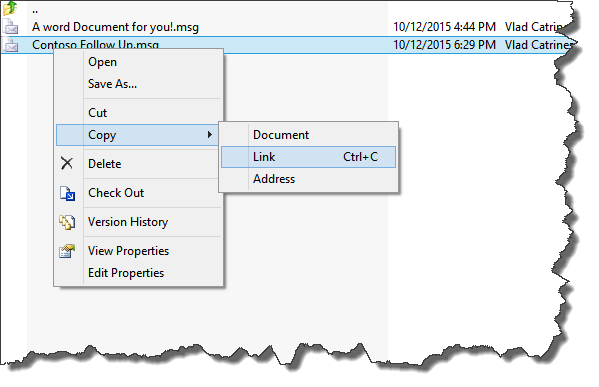 Classify email messages in SharePoint. harmon.ie automatically maps email headers such as ‘To,’ ‘From,’ ‘Subject,’ and ‘Received’ to SharePoint metadata. 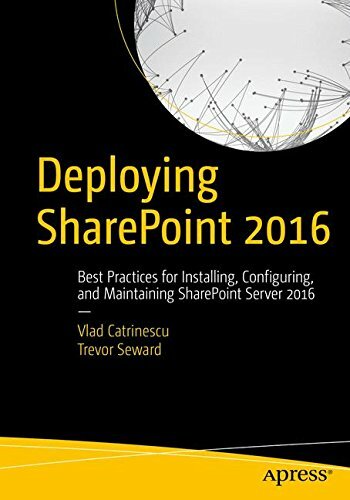 Retrieve email messages from SharePoint. When classified correctly and efficiently, finding email messages is a snap. You can even preview emails with one click. Collaborate with colleagues using email messages stored on SharePoint. Realize all the benefits of SharePoint document collaboration, now with email messages. In this review, I am not going to review all the basic features that harmon.ie has to offer as I have already talked about them in a past review on my blog. In this review, we will focus strictly on the new Managing Emails on SharePoint features. We will actually look at those features in the order of items from the harmon.ie website: Store, Classify, Retrieve, and Collaborate. One of the new features introduced in the harmon.ie Outlook add-in is the ability to drag emails from Outlook, directly in a document library in SharePoint. 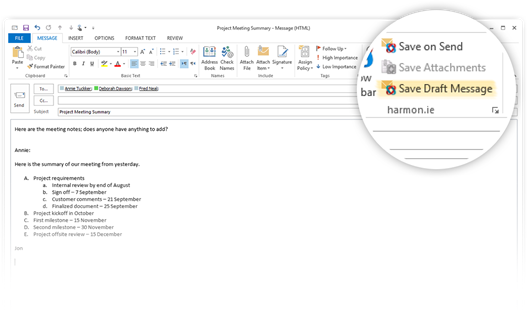 By simply doing a drag and drop from your inbox to the harmon.ie Sidebar, you can upload your email, as an .msg file into SharePoint. 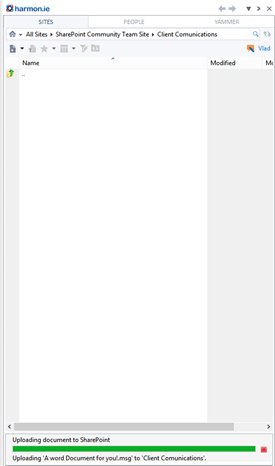 Unfortunately, it’s not easy to screenshot a drag & Drag, however after you drag and drop it, you can see the Uploading to SharePoint progress bar on the bottom of the harmon.ie sidebar. 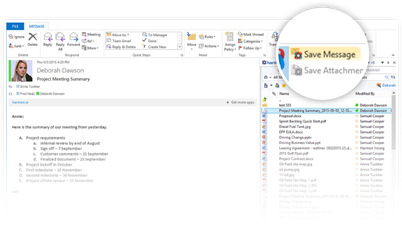 After the document is uploaded, you will have a message between the Email information and the actual email that displays where the message is saved in SharePoint. 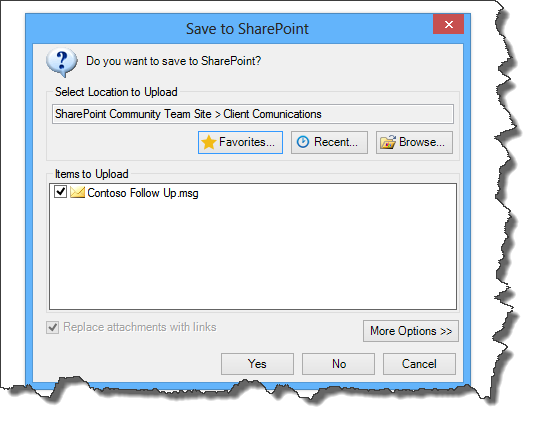 Another very smart way to save emails into SharePoint is as soon as you save them. When sending a new email, you have the option to save the email into SharePoint as soon as you send it, so you don’t forget! When clicking on send, a popup will appear asking you where you want to save it. It remembered my last location which was Client Communications, so I click Yes, and the email is sent to client, as well as saved to SharePoint. You also have the option to save a Draft Message to SharePoint, so you could share it with your colleagues and asking for opinions before even sending it to the client. I don’t have to remind you that a big part of SharePoint is the ability to classify information based on metadata. When dragging an email into SharePoint using harmon.ie, all the data is saved into SharePoint as properties of the document. Properties such as Subject, From, To, Attachments, Date Etc.! This allows you to easily filter and find the documents you need afterwards! Those emails, are now filtered by the SharePoint Search engine so they can be easily found. Something I found out is that since the harmon.ie is an outlook add in… And not a SharePoint solution, you don’t get all the fields pre-provisioned for you. Meaning that, for all the automatic classification to be done, you need to have all the columns in SharePoint created beforehand. 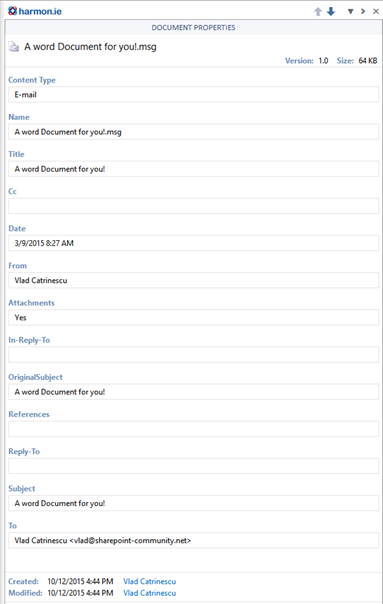 You can either create your own columns, or download the feature pack containing a Document Library template with the Email columns directly inside. For SharePoint Server, it creates a content type you can add to any library, however for SharePoint Online, for now it’s only a template document library, but you cannot add that content type to another library. By having our emails in SharePoint, we can now treat them as pure SharePoint documents, instead of emails. 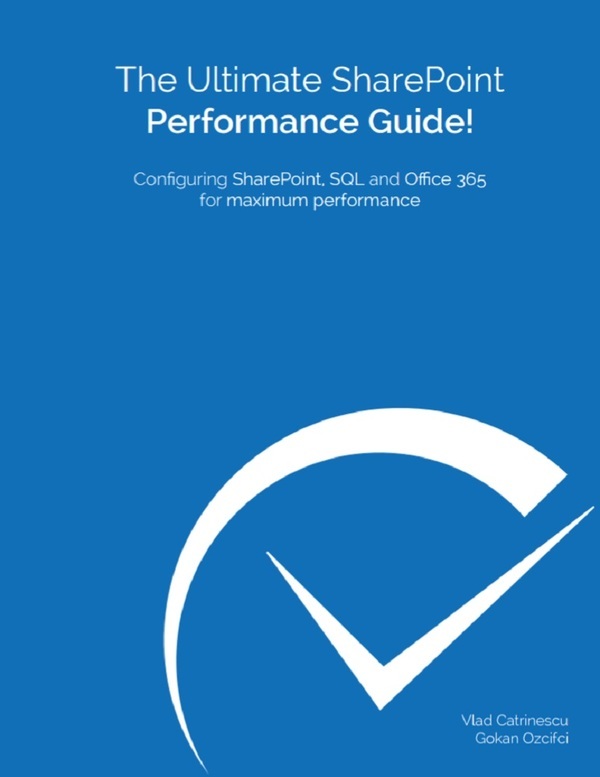 That comes with all the editing and versioning capabilities of SharePoint! For Example, once I save a draft of an email I want to send to a client in SharePoint, I could share the link to the document to my colleagues, so they can have a read before I send it. Once I copy it, I can send it to my coworker so he can bring the edits he wants to the Contoso Follow Up.msg document. After he gives me the Ok, I just double click the email from the sidebar, and send. All the changes done by my coworker will be in that .msg file, exactly as if it was your normal Office document. Harmon.ie also just released harmon.ie 2016 that already works and it’s integrated in Office 2016. The native integration of Outlook 2016 and Office 365 Groups as well as harmon.ie 2016 will make Outlook a true collaboration hero. The latest update to the harmon.ie Outlook Add-in adds a set of new features allowing users to easily manage emails in SharePoint as if they were documents, without ever leaving the comfort of their Outlook. By having emails in SharePoint, you benefit from the metadata around it (which is done automatically), the versioning as well as the history capabilities as well as from all the collaboration features that make SharePoint the great tool that it is. 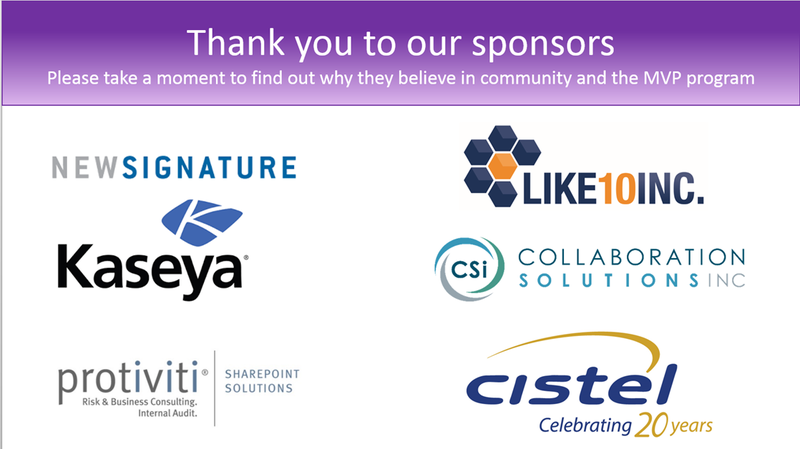 A few weeks late but I wanted to thank all the sponsors who made the Canadian MVP Party at the 2015 MVP Summit possible. Check out https://mvp.microsoft.com/ to learn more about the MVP Program!